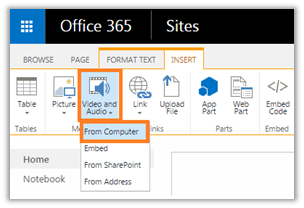 You can use the media web part to display a video or attach an audio file to your SharePoint online page. Click on the Video and Audio web part under the Insert tab. There are four options available to add a media to the SharePoint page. Click on Choose File to select the file. Select available Destination library to store the file in SharePoint. Add version comments regarding the file. Click Save to save the updates to the page. Choose Embed option to embed a video from any video sharing site e.g. Youtube. Grab the embed code from the video sharing site. E.g. on a Youtube site you will find Embed option under Share, copy the code. window of the SharePoint web part. Choose this option to select a media from the SharePoint library. Select the media from the SharePoint library. Use this option if you have a direct link or URL of the file. Type or paste URL in the window. The URL must directly link the video.